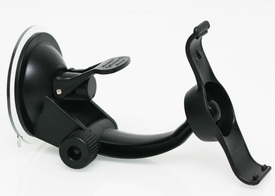 This is a windshield suction cup mount for Garmin Nuvi 50 series. It includes the standard Garmin 17mm ball joint vehicle suction cup mount and a removable bracket holder for the Garmin Nuvi 50 and 50LM. It is easily removable so you can take it from car to car.